You might have noticed a lovely new nativity scene displayed over the holidays at the baptismal font in the Sanctuary. 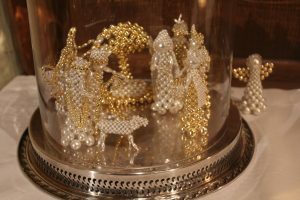 It’s made entirely of Chrismons, and it’s the work of Eleanor Sifford. Eleanor has been a member of the Chrismon Team for 20 years and teaches Chrismon classes the first three days of the month at Piedmont Floral Galleries, the official supplier of all Chrismon materials. Chrismons — literally “Christ monograms” — are all handmade and never sold. They are used around the world to tell the story of faith in beautiful, creative ways. Melanie Rufty Beaver, the daughter of Barbara Rufty, designed these Chrismons and Eleanor served as troubleshooter. “It’s hard to write how things are done with beads and wires,” Eleanor notes. Melanie and Eleanor donated the completed set to St. John’s, and Eleanor says some future pieces may be added. Eleanor works with the St. John’s Chrismon Team every Wednesday morning. The team makes special Chrismons for our milestones ministry (baptism, first communion, weddings, etc) and provides a specially designed Chrismon for all the children of the church each Christmas. Thank you, Eleanor, for such a beautiful addition to the Christmas decorations.